EfD-CA is part of the organizers of the VI SARA’s Institute Public Conferences series. Fellow researcher Matias Piaggio is part of the organizing team, this year’s theme of the conference is: “Seeking sustainable pathways for land use in Latin America. An interdisciplinary analysis of global drivers on local ecosystems” The conference will be held March 1st in the University Center of the Eastern Region, Maldonado, Uruguay. The events general objective is to identify the gap on the analysis of global drivers and it impacts on land-use decision and ecosystem services. It is also motivated to bring together scientists from different disciplines and policy makers to reflect on different aspects of the analysis of impact of global drivers on land-use decisions and ecosystem services that would help to move the knowledge frontier and the design of policies for the sustainable management of natural resources and to foster collaborations and networking by regional and international researchers on the analysis of global drivers and land-use decisions and ecosystem services in Latin America. 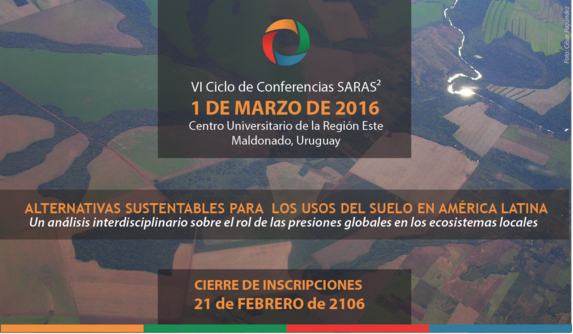 The South American Institute for Resilience and Sustainability Studies (SARAS) is an emerging transdisciplinary institute designed to generate critical insights allowing South America to build sustainable futures. It seeks integration across a broad range of knowledge using innovative approaches and integrating social and natural sciences, mathematics and arts.